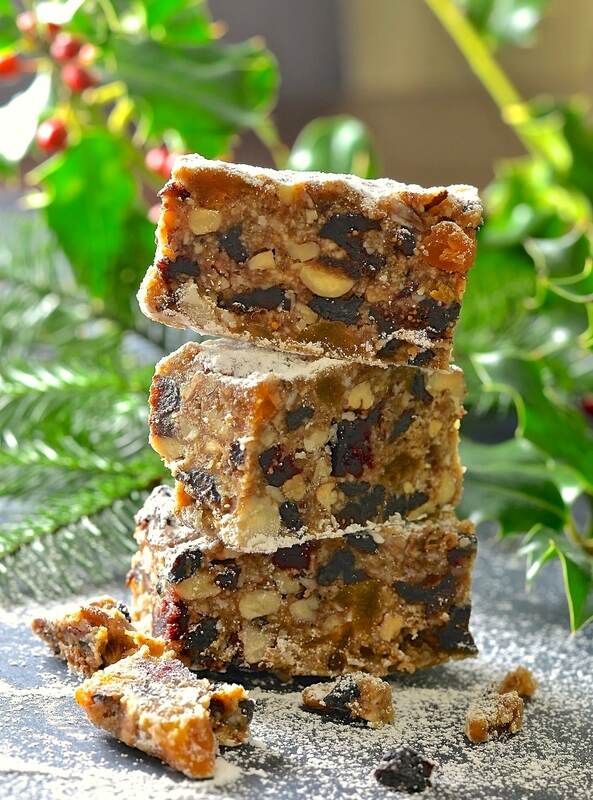 Festive fruit & nut flavours combine in this deliciously rich & moist Raw Vegan Fruit Cake. A fabulous alternative to traditional baked Christmas cake & so easy to make! I love Christmas and some of my favourite recipes are my Christmas ones. My Ultimate Vegan Christmas Pudding and my Vegan Brandy Butter are two of my favourite recipes ever and this Raw Vegan Christmas Cake is up there with them too. I had been planning to make a traditional baked Christmas cake to share with you before the big day. Then a couple of months ago I was experimenting with a kind of festive Larabar type treat. Ingredients were combined and left to set in the fridge and when I tried the finished bars I discovered that they tasted like Christmas cake. That was when I had the idea of attempting a Raw Fruit Cake based on the Larabar recipe I had been developing. So this cake came about accidentally but let me assure you that it is a very good, very worth-making accident. 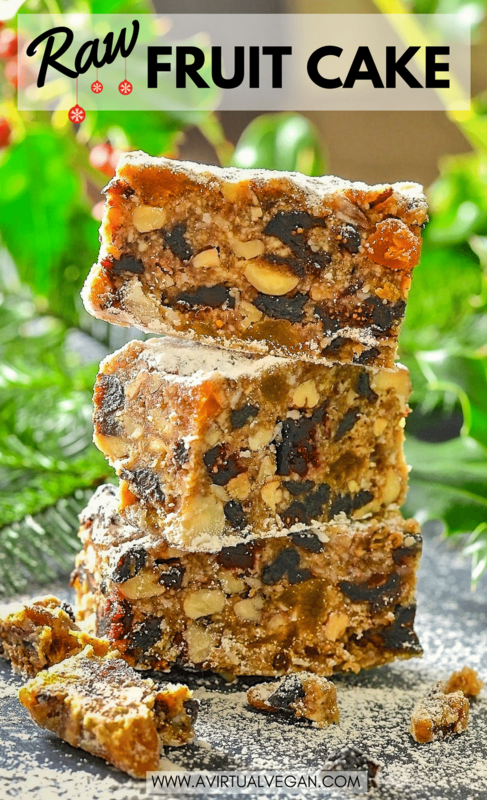 This Raw Vegan Fruit Cake is a delicious alternative to traditional baked Christmas cake. It is dense with dried fruit and nuts, rich, moist and has the most amazing soft, chewy and crunchy texture. It is also really easy to make and completely fool proof. And of course as it is raw there is absolutely no baking involved! Such a festive win! This Raw Vegan Fruit Cake contains absolutely no flour, no eggs and no dairy which makes it vegan and safe for those who are dairy and gluten intolerant. It also keeps for weeks if wrapped well and stored in the fridge. I love that aspect of it! Blend up the maple syrup, coconut oil, dates, spices, vanilla bean powder, salt & almonds. Spoon out and into a large bowl then add all of the other ingredients. Stir really well to combine. USA Pan are always my first choice when it comes to bakeware and theya ren’t sponsoring this or anything. I just love their pans! Cover and put in the fridge overnight or for about 12 hours. Turn out, slice and dust with cocoa or powdered sugar before serving. Everyone who has tried this Raw Vegan Fruit Cake raved about how good it is. Please don’t be put off by it being raw. None of my ready and willing testers even noticed and all of them went back for seconds…or thirds. The list of ingredients is somewhat long but it is so easy to throw together and please feel free to sub any of the dried fruit for whatever you like or have on hand. You do however need to include the dates and I would strongly advise using the dried figs as they are a key ingredient. Without them the taste, texture and structure would suffer. The other dried fruits are very flexible as long as you end up using the same overall quantity. I think that this is one of my favourite recipe creations so far and I am so excited to share it with you! Please let me know what you think in the comments below and tweet or Instagram me your pictures. I am @avirtualvegan on both. Use the hashtag #avirtualvegan on Instagram. If you are looking for more festive recipes then be sure to check out the holiday section in my recipe index. You can find it here. Store leftovers well wrapped in the fridge. They will keep well for up a couple of months. Medjool dates are softer than regular dried dates.You can usually find them in the produce department of grocery stores. If you can't find them, you may use regular dried dates but soak them in warm water for 15 minutes first to soften them up a bit. Make sure to drain them very well after their soak. Wow Joe, I’m so pleased you think so. Thank you! I made this cake but ended up cooking it as I was not sure my father would like it raw. It cooks up brilliantly as well! I tried this raw fruit cake few days ago my friend made it and I couldn’t stop eating it . I’m not a fun of fruit cake but this is delished I just bought all the rngrrdients and making it later . I’m so happy to hear that! Enjoy making your own and thank you so much for stopping by to leave feedback. I really appreciate it! When you say ground almonds…how fine are they? Like small chopped bits? Almond meal? Or can I use almond flour? I’m English and we call almond flour, ground almonds, so that’s what I intended, but in this recipe meal is ok too. Definitely not small chopped bits though. I made these yesterday! They are beyond delicious! Thanks for a new Christmas treat. I’m so pleased you are enjoying it Anne! Hope you are well? 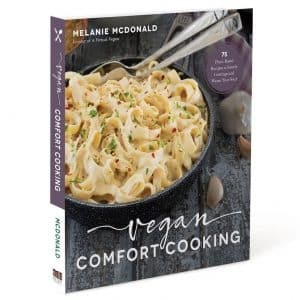 Mel, This is a really, really, really delicious recipe. The nuts and fruit pieces suspended in the creamy date mixture is just perfect. It was difficult for me to stop eating it after taking it out of the fridge the next morning. I would say, though, that it is more of a confection than it is a cake. It reminds me somewhat of a creamier Torrone nougat. Super good! I have trouble keeping myself from eating and eating it too! I’m so pleased you enjoyed it Tom! Awesome! Had to give some away. Not because it wasn’t delicious, but I couldn’t stop eating it! Ha ha! I’m so pleased you enjoyed it! Ive got a few questions for this cake. 1. Is it possible to sub the coconut oil with butter? I live in a tropical country and the coconut oil is liquid at my room temperature. If yes, what amount? 2. And can I use honey instead of maple syrup? 3. Also, if I wanted to make an alcoholic version, would you recommend soaking the dates in some brandy first?Since it”s an addition of more liquid, would i need to make any other changes? I think it would work fine with liquid coconut oil. It will mix up fine and you have to set it up and store it in the fridge anyway. I guess once you cut it to serve you’ll just have to eat it relatively quickly before it starts melting. I’m not sure how it would be with butter. I don’t think it would work nearly as well though. Coconut works well with the other flavours. I think the butter flavour would overpower it all. Butter has a different texture too which I don’t think would be as nice. With regards sweetener any liquid sweetener will work. And as for alcohol, personally I would soak the raisins or cranberries in it rather than the dates. Only because the dates get blended up and are the substance of the cake, whereas if you soak the fruit that stays whole you’ll get lovely little bursts of alcohol as you chew. Plus by doing it that way it won’t really affect the setting because the alcohol will be absorbed in the fruit rather than blended up in the body of the cake. I’d probably use 1 cup of brandy and soak the raisins and cranberries, being careful to discard (ok..drink ;O) any that isn’t absorbed to limit wetness. Bear in mind as the cake is raw, if you use alcohol it will be alcoholic, so be careful with eating it and driving etc. Hope that helps! I have been searching for a recipe like this for so long. It ticks every box for me. I’m not vegan but very rarely eat meat or dairy. I’m going to my local supermarket tomorrow to buy the ingredients as I can’t wait to try this. I’m not telling my son it’s vegan Or raw as I want to see his reaction after he eats it when I tell him. Thank you. Amazing recipe. Thank you Tracey. Everyone I have fed it to has loved it so fingers crossed your son (and you) will be the same! Thank you. So glad you are enjoying it Sandra! My hubby made this yesterday morning and we had a bit last night. Super sweet! Couldn’t have more than 2 little pieces. If he makes it again he’ll reduce the maple syrup down by 50%. Really good just be prepared it’s super duper sweet. Thank you. So glad you are enjoying it! I gave away 3 as small gifts and have gotten rave reviews back from every trip be. It’s going my to be a new Christmas tradition in our home now. That’s made my day. Thank you! 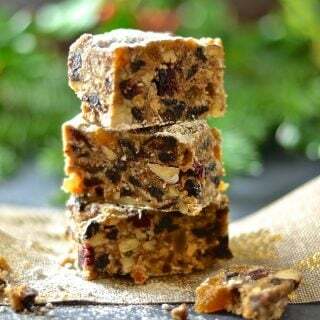 I’ve made many fruitcakes in the nearly fifty years I’ve been cooking, and this is the most delicious one I’ve ever tasted. The citrus peels and spices give the flavors I love, without the over-baked crusts that you get with the standard kinds. It’s moist and melts in your mouth, and I don’t miss the doughiness of the flour/sugar/egg/butter recipes I once made. Everyone who tries this loves it. I wasn’t too eager to try sifting cocoa over the top, but that variation was even more complex in flavor and irresistible. It’s hard to believe I could make this in just half an hour rather than half a day! 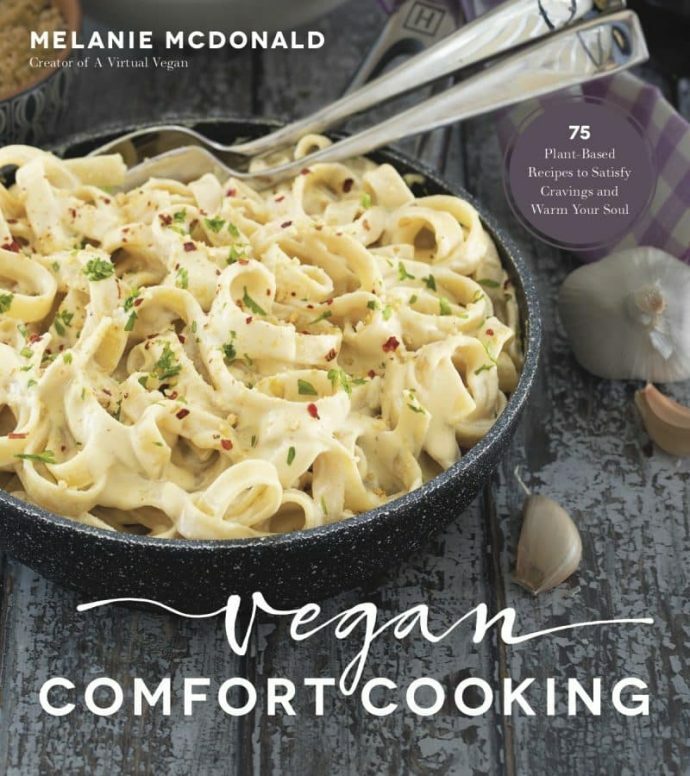 It’s perfect for vegans and those who avoid gluten, and you can just feel it nourishing you instead of weighing you down. Thanks so much for this wonderful treat! This will be requested for years to come. Wow Janet, what lovely feedback. You have made my day! I am thrilled you are enjoying the recipe so much. Thank you for stopping by to let me (and others) know. Much appreciated! Is there some way I could avoid the oil? To make it healthier. I try to avoid oil in anything I cook. The only thing that might work is coconut butter but I haven’t tried it so can’t say for sure how it might turn out. It has to be something that solidifies so the cake sets and is sliceable. We made this at the weekend. It is fantastic. Thank you! Any ideas what I could substitue forthe almond meal? Thank you Barb! I haven’t personally tried this recipe with anything other than ground almonds. If a nut allergy is not the reason you want to sub the almonds, then any other nut ground up into a meal/flour will work as a substitute. Hazelnuts, macadamia, brazils and cashews (or a mixture) would all work well. I would stay away from the stronger flavoured nuts like walnuts though. Be careful when you process them into a flour that you don’t go too far and turn them into nut butter! If a nut allergy is the reason you want to avoid the almonds then I think buckwheat flour (if you can’t find it you could buy buckwheat groats and bring them to a flour in a food processor or blender), sunflower seed meal/flour and perhaps even coconut flour would work. Coconut flour is extremely absorbent though so you might find that you need to add a little more moisture to make it all come together. A drop of water would do the trick I expect. I think if I had to try one I would firstly go with the other nut option and buckwheat would be my preferred nut free option. I hope that helps. Let me know how it works out! HolyMoly! 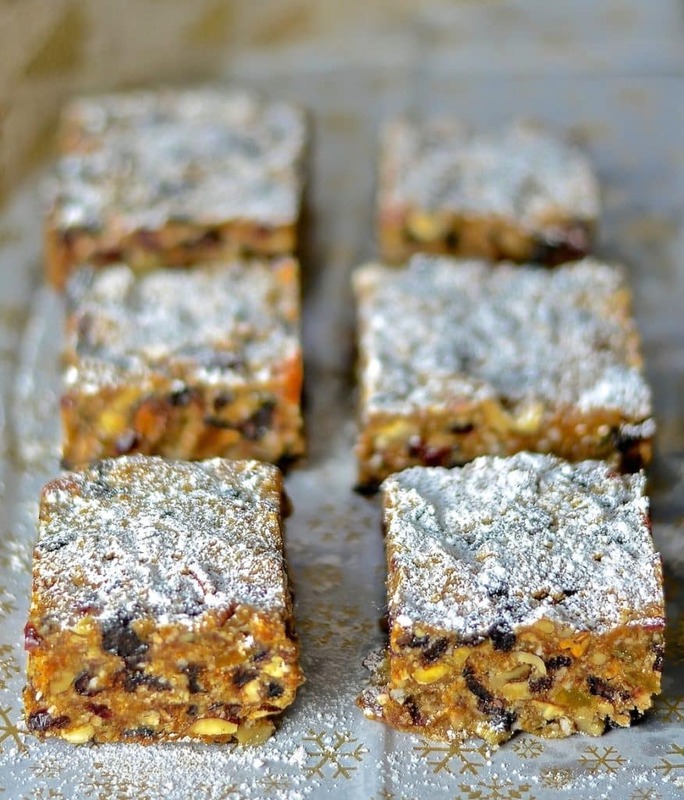 This is not just a Christmas Fruit Cake, it’s also a power snack at it’s best!! It’s loaded with good stuff and would make a great power snack pre or post workout. Wow, this sounds heavenly!! And I have totally left everything to the last minute, so I’m grateful you’ve got my back with this awesome recipe. I seriously can’t wait to try it! Thank you Gin! It’s a fabulous recipe for last minute making. I hope you enjoy it. Let me know! 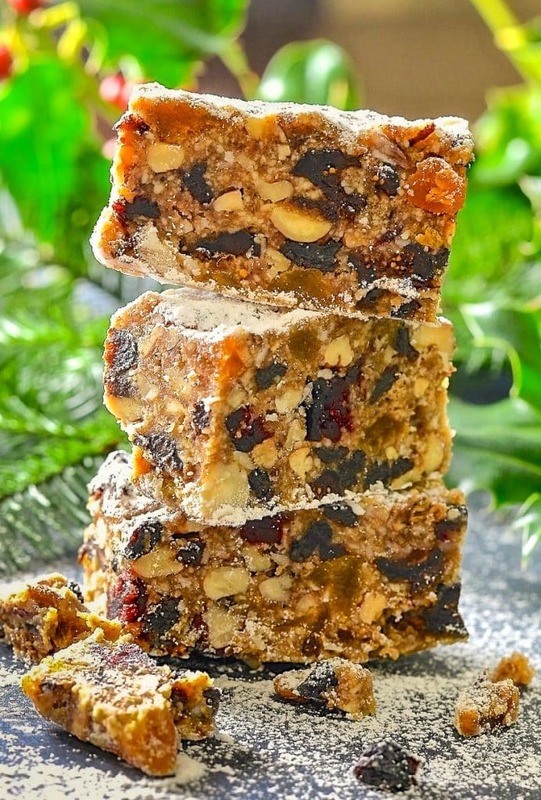 I love the idea of instant and healthy fruitcake! Thank you so much Kathy! It is so easy & quick to make. Perfect if you’ve left everything to the last minute at Christmas. Whip it up in less than half an hour on Christmas Eve and you’re all set! This is just perfect for Christmas and so healthy! So much texture going on! Thanks Brandi. The textures are amazing! Looks good, might have to try this! Do you think you could douse it in brandy like you would a traditional Christmas cake or might it go soggy? I thought about that but I think it would go soggy. I think you could however soak the dried fruit in brandy for a few hours first and drain it really well before adding it. If the mixtures a little wet after just throw in some more ground almonds to soak it up. What a beautiful cake! Love how healthy it looks! Thanks for sharing this recipe. We have a nut allergy but I think I can still make this work using seeds instead. Can’t wait to try. Hmm. I am not sure how you would replace the ground almonds in this recipe. They are pretty crucial. Because it’s raw you can’t really use flour. You can however easily sub a bit more fruit and some seeds for the chopped nuts that you stir through so if almonds are ok then you will be fine. If you can’t use the almonds then all I can think of that might work is coconut flour. That is good raw. When you mix it all together you might need to add a little water if it’s too dry or a little more flour if it’s too damp. Toasting your seeds before adding them might be good too to add a bit of nutty flavour. I hope it works out for you. Let me know! Thanks Linda! I know what you mean about the grocery store ones. Those awfully processed glacé cherries & the bright green bits. What are the green bits anyway? It makes me cringe! Thank you! I am so proud of this recipe. You will love it! Finally a fruit cake that I would want to eat! How fun. Thanks for sharing. That’s what I like to hear! Enjoy! This looks so lush, one to try out for sure! Thanks Hedi! Let me know what you think if you make it. How fabulous. 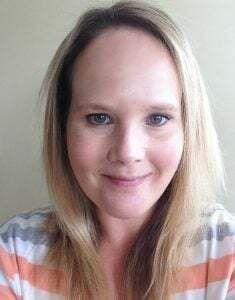 I’m making my mother who has food issues a basket of goodies and my cakes are awesome but she can’t eat them..This is a great alternative for her along with the other things I’ve planned. She will love it! Wow, this looks amazing, so like a classic Christmas cake. It sounds delicious too. i’m super impressed. Thank you so much! It is very like real baked Christmas cake & is so much easier to make.